This service added for 2012. Solar Panels need to be kept clean in order to perform to their maximum capacity. Installation companies recommend a twice yearly clean to keep your panels running efficiently. I use only pure, de-ionised water to clean Solar Panels (no chemicals at all). Cleaning is done with ultra light carbon fibre poles running pure de-ionised water to a soft brush head which is used to gently lift dust, dirt, algae and bird droppings. This system of cleaning leaves panels crystal clean for several months. 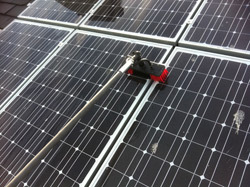 As a rule of thumb, if I can see your Solar panels from your property, I can clean them. Price guide: 2 - 10 panels = £6 per panel. 11+ panels £5 per panel.